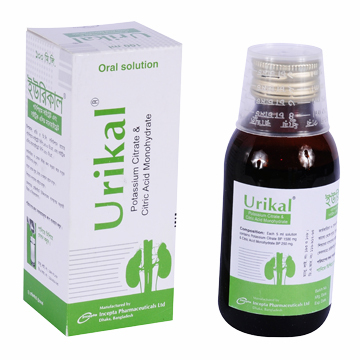 Urikal 100 ml oral solution: Each 5 ml solution contains Potassium Citrate BP 1500 mg and Citric Acid Monohydrate BP 250 mg.
Urikal 200 ml oral solution: Each 5 ml solution contains Potassium Citrate BP 1500 mg and Citric Acid Monohydrate BP 250 mg.
Potassium Citrate and Citric Acid oral solution is a stable and pleasant-tasting oral systemic alkalizer. Potassium citrate is absorbed and metabolized to potassium bicarbonate, thus acting as a systemic alkalizer. This product alkalinizes the urine without producing a systemic alkalosis in recommended dosage. It is highly palatable, pleasant tasting and tolerable, even when administered for long periods. Potassium citrate does not neutralize the gastric juice or disturb digestion. Adults & children over 6 years: 10 ml 3 times daily, diluted with 1 glass of water. Children 1-6 years: 5 ml 3 times daily, diluted with 1/2 glass of water. Adults: 10-15 ml 4 times daily; or as directed by the physician, diluted with 1 glass of water. Pediatric: 5-10ml 4 times daily; or as directed by the physician, diluted with 1/2 glass of water. This solution is generally well tolerated without any unpleasant side effect when given in recommended doses to patients with normal renal function and urinary output. However, as with any alkalinizing agent, caution must be used in certain patients with abnormal renal mechanisms to avoid development of hyperkalemia or alkalosis. Potassium intoxication causes listlessness, weakness, mental confusion, tingling of extremities, and other symptoms associated with a high concentration of potassium in the serum. The solution should be used with caution in patients with low urinary output. It should be diluted adequately with water to minimize the possibility of gastrointestinal injury associated with the oral ingestion of concentrated potassium salt preparations; and preferably, to take each dose after meals. Large doses may cause hyperkalemia and alkalosis, especially in the presence of renal disease. No information is available regarding the use of this drug during pregnancy and lactation.